Slice and Bake Peppermint Cookies are amazing in ice cream or gelato–keep reading to check out what all of the Creative Cookie Exchange hosts made this month with ice cream! Cacao nibs do not always substitute well for nuts. It always pays to read through the entire recipe before starting to bake. My new brother in law must really like me/be comfortable with me, since he told me my first attempt at cookies for this post would not make me any friends (I love you too, Jason! Really–that kinda made my day!). Slice and bake cookies are always a good fallback cookie. Photographing at other people’s homes is tricky, even with your camera and tripod. It is really hard to photograph ice cream! Especially when the focus is the cookie garnish in the ice cream. Holy cow but slice and bake shortbread type cookies are really delicious in ice cream! So yeah my weekend. I tried a riff on a macaron type cookie that used cacao nibs and it was an abject failure. And repeatedly, embarrassingly, I messed various steps up from not reading the recipe closely enough. My hilariously honest niece (and she was not wrong anyway) told me they tasted like chocolate gum! Hey you win some and lose some, right? I panicked for a moment or two–after all I host this event, and then decided to make an entirely peppermint cookie, with no chocolate at all. The slice and bake part was an easy decision, because slice and bake cookies are so easy. And I was doing this at my mom’s house, in between making a chipotle bbq sauce of sorts and helping Alex make chocolate chip cookies. And trying to stay out of my mom’s and sister’s ways, who did the lion’s share of the cooking. And the photographs? Well, the one above with a white mint chocolate chip was at my mom’s house–where I suddenly realized that even though I was ok with the bowl and the lighting and the wooden table, I was not ok with the monochrome earthiness of the picture. Ack! Nothing I could do about it though. My original plan was to just make do with those photos, but I brought the cookies home with me, and today Alex and I bought several flavors of gelato to serve with the cookies. So I figured why not take some more photos? The bowl you see in the photo above you? I love that bowl for little odds and ends, like the Spiralized Thai Cucumber Salad from the other day. 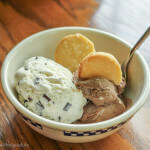 I served John a mint chocolate chip gelato with the cookies, which he ate quite happily. And then got into a tickling wrestling match with Sammy and knocked the bowl to the ground, breaking it. Picture my disgruntled blogger face. Yes it was the only one I had. Alas. So after that I got a little more creative, which is why you see the cookies garnishing ice cream in lots of different bowls. And the best flavors for these cookies were dark chocolate, coffee and mint. In ice cream or gelato. So why cookies for ice cream? 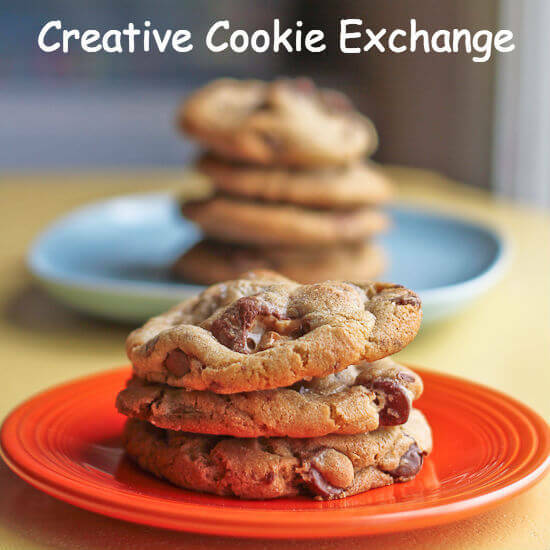 Creative Cookie Exchange this month went all cool and frosty with cookies and ice cream! It could be a cookie used for making ice cream sandwiches, a cookie made for smooshing into ice cream or cookies for garnishing ice cream. We’ve got you covered! 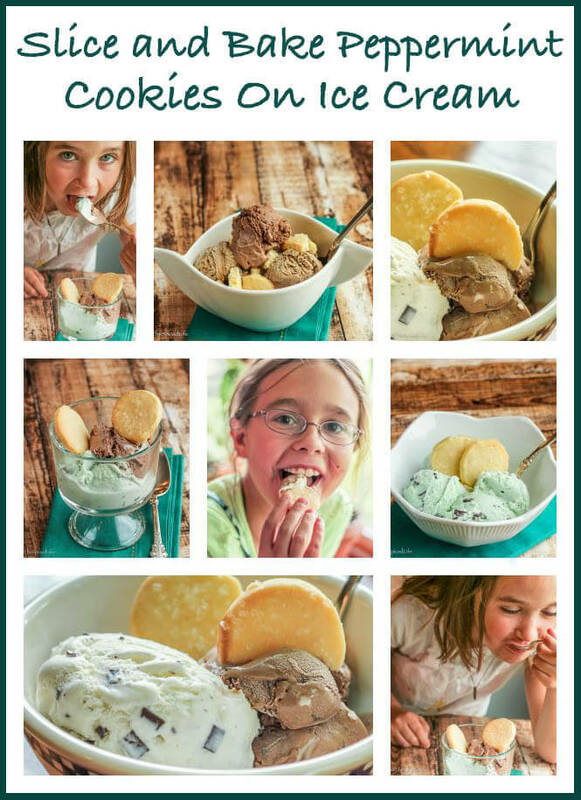 Please read down below to all the links for fabulous cookies with ice cream! And take a moment to seriously appreciate their photos too–I am telling you it was tricky and I still don’t love the pictures. The ice cream melts quickly, you need a ton to not look skimpy, the cookies, while seriously scrumptious in ice cream, are fragile and you just want them crumbled anyway (you can see I gave up in one series of photos) but arranging them as a garnish seems prettier…. Yeah. Just trust me. This is awesome even if the photos are not. Closely adapted from Smitten Kitchen. Prep and baking time do not including a minimum 30 minute chill time. So plan ahead! Beat the butter until creamy. Scrape down the sides and bottom of the bowl. Beat in the confectioners' sugar until light and fluffy. Scrape down the sides and bottom of the bowl again. Beat in the egg yolks, one at a time. Beat in the peppermint extract. Scrape the bowl. Whisk the salt into the flour in a separate bowl. Slowly mix the flour into the dough, one third at a time. Finish the mixing by hand and be certain to not over-mix. Divide the dough into 2 equal pieces. Roll each piece into a log, and then roll the log into plastic wrap. Tightly seal each log and then place into the fridge to chill for at least 2 hours, preferably overnight. When you are ready to bake, preheat the oven to 350 F.
Slice the cookies 1/3-inch thick and place on a cookie sheet lined with parchment paper or a silicone mat. The cookies should be about 1/2-inch apart--I got all cookies baked onto 2 cookie sheets. Sprinkle the cookies with the coarse sanding sugar. Bake for 12-14 minutes, until cookies are set and just barely starting to brown. Let cool completely on the cookie sheets. Serve with ice cream or gelato of choice--I liked coffee, mint and dark chocolate best. 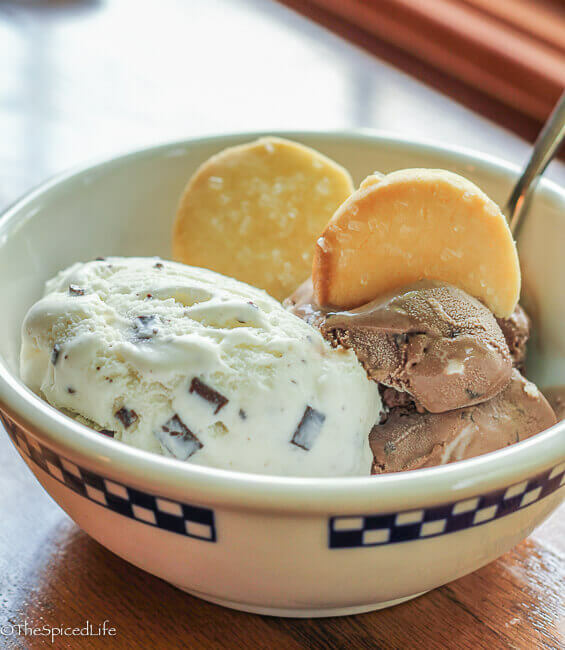 The theme this month is Ice Cream Cookies–any kind of cookie that works well with ice cream in any form–could be an ice cream sandwich, could be the perfect cookie garnish! 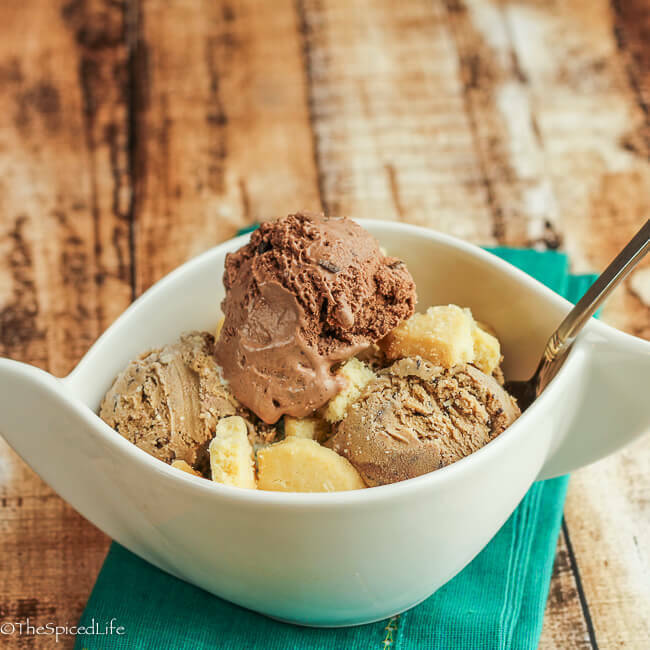 If you are dying to beat the heat with a fun ice cream creation involving cookies, we’ve got you covered! If you are a blogger and want to join in the fun, contact me at thespicedlife AT gmail DOT com and I will get you added to our Facebook group, where we discuss our cookies and share links. Great idea and cookies! Awesome recipe! Thanks for sharing! I’ve had a few favorite bowls/plate break in my time and it is always heartbreaking! 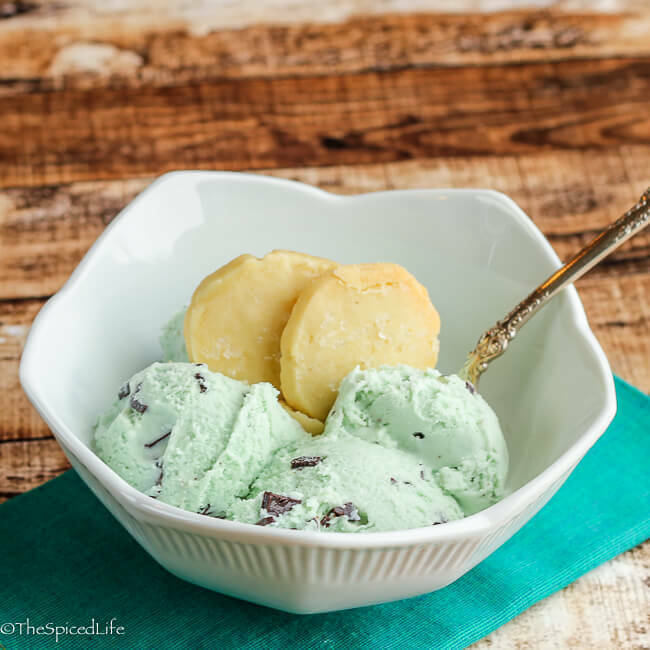 Love that these are mint cookies without the chocolate…so perfect for ice cream! I love peppermint cookies, these look so yummy! 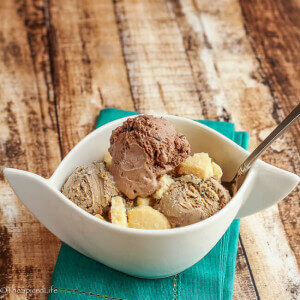 these cooking look amazing… and in chocolate ice cream?! SOLD! These look amazing and I cannot wait to give them a try! What a deliciously refreshing cookie for summer. I usually think of peppermint for Christmas but love the thought of that minty flavor on a hot day. And with chocolate ice cream? OK, I’m sold! Your photos are just fine! I have heard that there is fake ice cream you can buy just for this purpose, lol. Your cookies sound delicious and I love your bowl collection! Your icecream, cookies and photos are real . And thats what I loved about this post. It is honest and real. And I havent ever had peppermint cookies in summer! but Now that I think about it, mint sort of means summer! so why not peppermint cookies! Breaking a favorite dish is always disheartening. My husband always says, “Something evil was going to happen to someone in the family, but instead the evil broke in the dish.” (He is Lebanese.) I find this a refreshing response and it helps to keep things in perspective. Very nice cookie recipe, would be great for the Holidays as well. Oh my gosh I LOVE that!!!!!! Thanks for sharing! 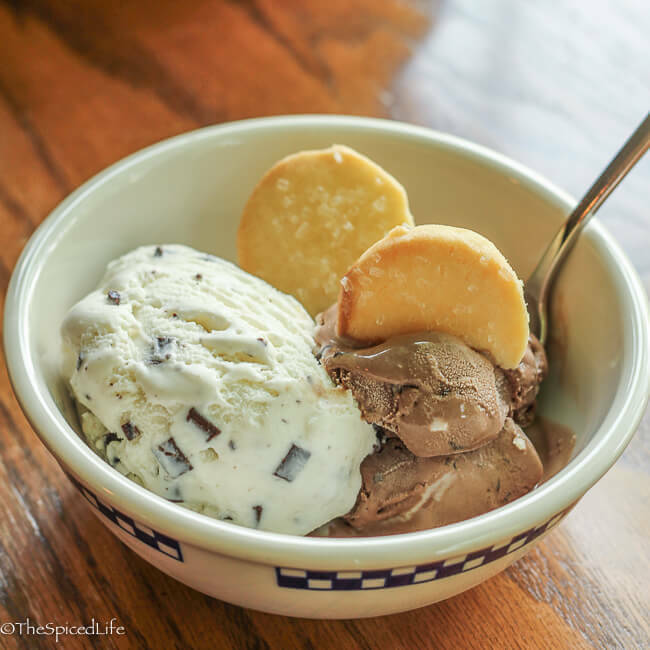 You can never go wrong with cookies and ice cream! They are always a delightful and delicious combination! How buttery do those cookies look, so so good with ice cream or just about anything I can imagine.